La Manga del Mar Menor (Murcia , Spain ) is a unique place . It is a strip of land 24km long which is formed by the sand dunes of the Mediterranean Sea . Ocean currents that were accumulated sand here , at first it was only separated from each other in the end became a single language dune islands. West of this language is the Mar Menor. Ecological and natural specialties make the Mar Menor a unique natural area and lake Europe's largest salt water. This makes it a perfect place for all kinds of water sports, with a maximum depth of 7 meters and an area of ​​170km2 and beaches around the lagoon. In La Manga is a superb climate. In summer we cool breezes that occur between the two seas meet , and in winter we heated the same and it is rare that the temperature drops below 15 degrees . Many days between November and March can have bright sunshine and 20 degrees in the shade. The area is famous for its 320 days of sunshine a year, making it the sunniest corner of Spain. 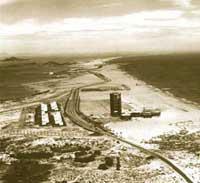 La Manga was formed by accumulation of sand transported by ocean currents . Sediments surfaced to the surface when hitting volcanic formations and originated what is now known as Mar Menor . Although La Manga acquired its present morphology in the seventeenth century , the earliest human settlements us back to the Neolithic. About 5,000 years ago , a town in Las Amoladeras rose at the entrance of La Manga. The settlement consisted of a group of circular huts , built of branches and mud. The town did not have any kind of fortification and its inhabitants lived by fishing and gathering shellfish. 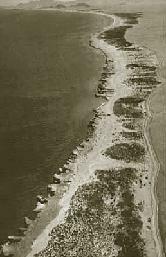 The environment consisted of large tracts of forest up to the seashore. The richness of the Sierra Minera and the exceptional conditions of the Mar Menor attracted new settlers . Iberians, Carthaginians and Romans exploited the silver mines and fisheries developed prized in antiquity. In pre -historic times La Manga was used as a fish farm , as evidenced by the remains found at El Estacio pools . In the underwater world of La Manga found numerous remains of Phoenician ships , Greeks and Romans , carrying silver bullion , lead and amphorae with all kinds of goods. The arrival of the Arabs involved the creation of Encañizadas , fishing method that is still used . Using stakes and reeds, fishing mullet and other species typical of the Mar Menor was performed. After the expulsion of the Moors , La Manga received the siege of boats that hit the North African coast. To defend against attacks , Emperor Charles and his son Philip II ordered the construction of three towers smoked in La Manga and Cabo de Palos more . Large tracts of forest with trees such as pines , oaks and yews were progressively decimated since the Middle Ages. In the eighteenth century the exploitation of wood and scrub in La Manga was accentuated by increasing deforestation by wind action . In 1862 headlights Estacio and Ants Islands are built and three years later the lighthouse at Cape Palos. The existence of numerous low submarines for centuries caused great maritime catátrofes in the area. The wreck of the Sirius in 1906 , which killed more than three hundred people , is one of the most remembered . In mid- eighteenth century, coinciding with the paying back process , the name is linked Maestre La Manga. At public auction, the family acquired the north. In early 1960 , Francisco Tomás Maestre Celdrán purchase the rest , and initiates a development plan supported by the Ministry of Education and Tourism. In full developmental stage , La Manga was driven by the Law Centres Tourist Interest in 1963. A year later , the first building at the entrance to La Manga, the Black Tower is built. Shortly after the first two hotels, and Galúa Entremares are inaugurated . La Manga has since grown to become one of the most important tourist attractions in Europe.